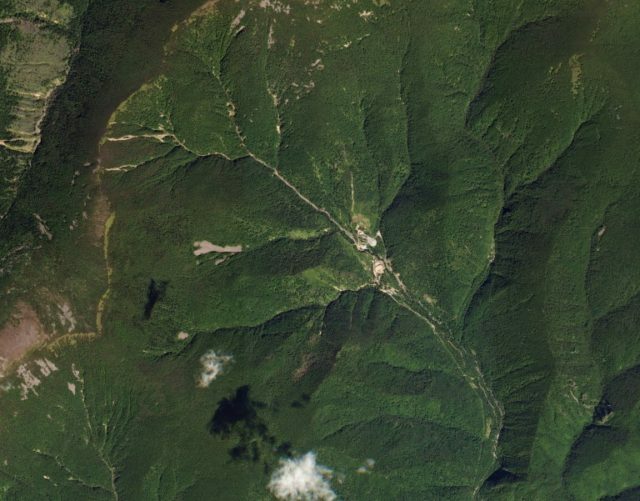 The study is the latest to conclude that nuclear testing has significantly jeopardized the integrity of the mountain, which has led many international observers to conclude that the Punggye-ri Nuclear Test Site can no longer handle nuclear testing. If so, communist dictator Kim Jong-un’s promise to shut the site down carries far less weight, as it will be no loss to him to officially end testing there. The study, published in Science magazine this week, used synthetic-aperture radar (SAR) images taken during the day of and immediate aftermath of North Korea’s sixth nuclear test on September 3. Satellites measured the distance between themselves and the mountain at different spots throughout the before and after of the nuclear test to determine shifts in height. “Combining insight from geodetic and seismological remote sensing, we found that the aftermath of the initial explosive deformation involved subsidence associated with sub-surface collapse and aseismic compaction of the damaged rocks of the test site,” the scientists write. In other words, much of Mount Mantap appears to have collapsed into itself, potential destroying necessary scientific structures within that belonged to the Punggye-ri site’s infrastructure. Chosun Ilbo, a South Korean newspaper, summarizes the results of the study as having found that the mountain actually rose two meters (about 6.5 feet) as the blast occurred, then collapsed back down lower than it initially stood. Chosun notes that the study suggests the mountain is continuing to lose height. The Wall Street Journal notes that the results of this study indicate significantly more damage to Mount Mantap than those published previously, which had also concluded that a seventh nuclear test at the site would pose significant danger of collapse and wide distribution of nuclear waste throughout the region as a result. Mount Mantap is an estimated 70 miles from the border with China, which faces a significant threat of environmental disaster from such an event occurring. One of the authors of the study, Sylvain Barbot, tells the Wall Street Journal that a new North Korean nuclear test “may require a substantial investment in the construction of another facility elsewhere.” Given President Donald Trump’s campaign for unprecedented international sanctions on North Korea, the question of where Kim would get the money to build such a site becomes key in how possible such a plan is for the regime. Last month, two separate groups of researchers concluded, using satellite evidence, that Punggye-ri was “useless.” A professor at Yonsei University, Hong Tae-kyung, told the South Korean newspaper Chosun Ilbo that Mount Mantap had suffered “a total of 10 earthquakes over magnitude 2.5, which were believed to have resulted from the collapse of tunnels” between September 2017 and February 2018. In March 2017, six months before the September test, a North Korean official who defected to the free world warned in an interview that a fifth test at Punggyi-ri (the site did not host one of the six total) could potentially devastate the landscape, “break the country in two pieces,” and trigger a revolt against Kim. While the revolt never occurred, evidence suggests that both North Korean officials and their patrons in China have concerns about the integrity of the site. While scientists use satellite images to determine the extent of the damage of these nuclear tests, political observers look for signs that Kim may be getting ready to use the site once more—or shut it down. The Sydney Morning Herald reports that observed activity around Punggye-ri this month appears to indicate that, true to his word, Kim has ordered the winding down of operations in the area. Tents and buildings appear smaller in number, while foot and car traffic has slowed. North Korean officials are well aware of international monitoring, however, and some analysts warn that they may have ordered less activity at the site to generate goodwill shortly before Kim meets Trump in person. The first reports of major damage at the nuclear test site appeared in Japanese media in October. Multiple outlets citing anonymous sources with knowledge of the inner workings of the North Korean government to report that a deadly collapse had occurred under Mount Mantap. According to those sources, a large tunnel within the mountain collapsed shortly after the September nuclear test, immediately killing an estimated 100 workers and killing another 100 first responders who entered the mountain for rescue operations. That collapse, satellite images indicated, caused landslides on the side of the mountain, an observation in line with the study published this week finding that the mountain has shrunk. North Korea has promised to participate in the “full denuclearization” of the Korean peninsula. Kim Jong-un is scheduled to meet President Trump in Singapore on June 12 to discuss the nuclear threat and a potential end to the Korean War, among other topics.